I had fully anticipated the Buckeyes eating Bevo for dinner last night, but apparently our defensive linemen are vegetarians. Who knew? Oh, that’s right…you did. Congratulations on the victory. A year which gave Mack Brown his 200th win, and gave Colt McCoy an NCAA record for completions, also gave us Buckeye fans our third bowl loss in a row. You must admit, however, that we gave you a run for your money. You can't tell me you weren't a little bit worried. Give our quarterback a couple of years, and then we’ll talk. Let's face it, if there had been a minute or two left after we scored, it probably would have gone the other way. Thanks for the wager and the sportsmanship; but the picture of W wasn't necessary. He's transplanted anyway; wasn't he born in Maine, or something? Wow, sorry you ate some crow this morning, but NukeDad was a real gracious winner. I am waiting though to see if he posts a victory dance video on his blog. Momo's humble pie tastes sweeter than I expected. I had to go to espn this morning to see the score cause they don't broadcast that stuff here. Sorry you had to eat crow. Sorry about the game :( Your concession post was very well done, gracious and beautiful, as we know you are! Much better than I would have done. This losing bowl game after bowl game is getting old - and it's painful. I'm sure that was hard to write, but very gracious- good for you- soory for your team. P.S. 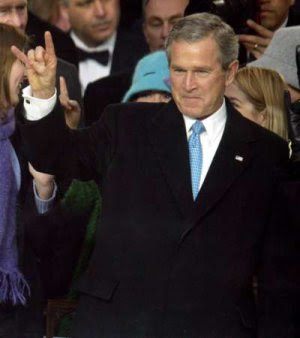 Not a Longhorn fan; I didn't grow up around American football, and don't get it. Dude, the person above me works in the UT Tower and didn't know about the game?!! I'm not a big football person at all, and I had to be hiding under a rock not to know. 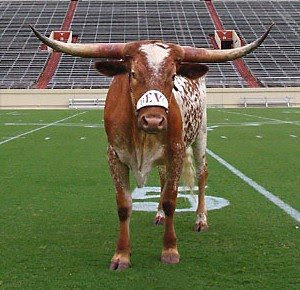 Anyway, Longhorns apparently did awesome, but it sounded like a close game. Whew. Yeah...They can KEEP Him! That's for sure!! AMEN sister. It was a good one. There's always next year! I ♥ momo she is very gracious...now are you gonna root my sooners on? That had to hurt a little. *sigh* I feel your pain Momo. Actually laughing out loud here. UT did not let him in. Seriously. as a fellow buckeye, i will be passing your words of wisdom along to all my depressed friends and family members - so well-written! There were a lot of screams and tears and items being thrown in our house the other night, but we have great hope for next season. Ohio State played better than expected, especially the defense, and Pryor made quite a few plays with his feet. However, in the end, Colt McCoy made the difference. I am an East Carolina University fan, and am really looking forward to next season. With a talented roster and many returning seniors and lettermen, the Pirates will most likely be a preseason Top 25 pick.